(2.21.11) Sweet little Jema was born with a congenital abnormality called cortical dysplasia, which has resulted in a severe form of epilepsy. Additionally, Jema lives with cerebral palsy. 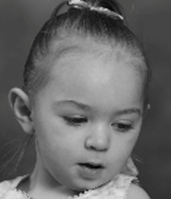 Jema experiences severe seizures and in January of 2010, she was having at least 30 seizures a day. Now at 20 months old, Jema's seizures are down to three a day, thanks to three anti-convulsant medications that she takes. Jema has doctor appointments three times per week and sees a cardiologist in Portland once a year. Even though Jema experiences severe developmental delays, doctors are hopeful that she will learn to walk between the ages of 7 and 9 years old, if not sooner. Jema's condition is difficult but she has been blessed with a very loving, supportive, and strong family. Jema's parents (Jeffery and Jaime) do everything within their power to not only take care of her but to also not allow her condition to keep her from social interaction with others. Jema also has a big sister named Taelyn and a dog named Jersey, both of whom she absolutely adores.